Bleach and Alternate to Bleach - Family Child Care, Inc. The key is that the bleach solution or bleach cleaning product must contain bleach at a concentration that is required in Rule 9502.0435 Subp13 (d) – 2 teaspoons of chlorine bleach to one quart of water. That mixture equals 1% so any product with that concentration or higher is acceptable. When making your own mixture it must be made daily. Clorox Clean-Up with bleach is acceptable (see photo). Do not confuse this with Clorox Anytime, as that is not acceptable. Wal- Mart has a Great Value brand cleaner (Multi-Surface Cleaner with Bleach) that also meets the requirements of the rule. The store bought mixes noted here have stabilizers in them that allow them to be used until the bottle is empty. Although wipes kill 99% of germs, they do not kill norovirus or rotavirus and for this reason do not meet licensing requirements. Commonly found Lysol or Clorox wipes do not meet the Rule 2 standard and are not approved for use . 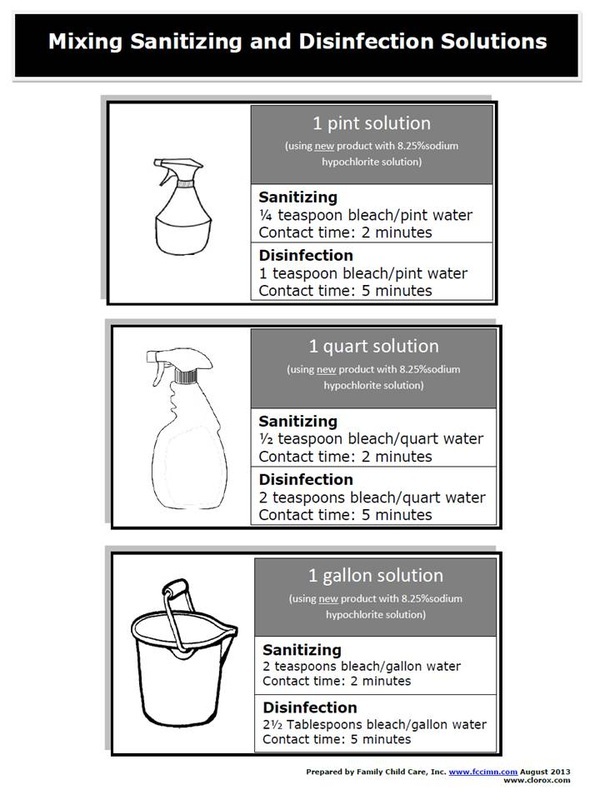 PLEASE NOTE: the disinfectant time is 10 minutes, meaning that 10 minutes after wiping your diaper changing surface, the surface will be properly disinfected. FCCI does not endorse a specific alternate to bleach product. 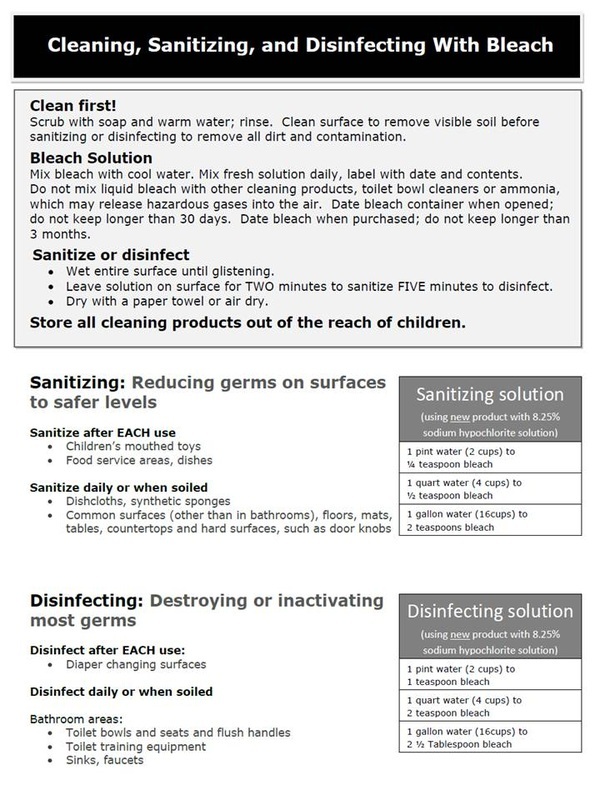 Products are listed as a resource for providers who would like to use an alternate to bleach for disinfection in the diapering area. Other product are available on the market. It is the providers responsibility to research products and verify use with licensing. Print for your easy reference.